Today is my mom’s 56th birthday, so I’m sure you can guess what I’ll be making for her! When it comes to chocolate cake, my mom has always liked to dress it up with whipped cream and berries, so I got out easy by not having to make frosting. I’m a big fan of making cakes from scratch when I can and have learned some new baking tricks over the last few years. My all-time favorite baking hack is using coconut oil instead of butter. To do so, simply replace the butter or vegetable oil in the recipe for coconut oil in a 1:1 ratio. 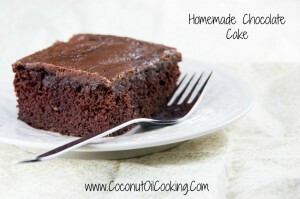 Adding coconut oil to any of my baked goods has eliminated dryness and also added extra flavor, especially in any recipes that calls for chocolate. The recipe that I always make contains coffee, which I feel brings out the flavors of the chocolate cake even more. If you’re not a fan of coffee, feel free to omit this. 1. Preheat oven to 350 degrees. Spray a round or square cake pan with Kelapo Coconut Oil Cooking Spray. Set aside. 2. In a large bowl, combine flour, sugar, cocoa, baking soda, baking powder, and salt. Mix well. 3. Next, add eggs, coffee, buttermilk, coconut oil, and vanilla. Beat with a mixer for 2 minutes on medium speed. Pour mixture into cake pan and place in the oven for 30-40 minutes or until a toothpick comes out clean (from the center of the cake). 4. Let the cake cool for 10 minutes, remove from cake pan, and then set on a wire rack to finish cooling. If you have your own frosting recipe, feel free to use that on the finished cake. I’ll be whipping my own cream and then garnishing with berries once the cake is served later tonight. For a lighter choice, check out this recipe for a lemon cake with cream cheese frosting that I made for my mom a few years back.